In this tutorial we'll see how to repeat the same task automatically on a large number of image. This is what we call a batch procedure. 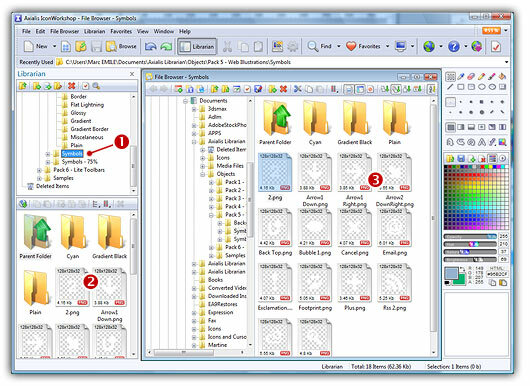 Several batch procedures are implemented in IconWorkshop. We access these features from the built-in File Browser. 3. When done, the files appear (with preview) in the right pane. 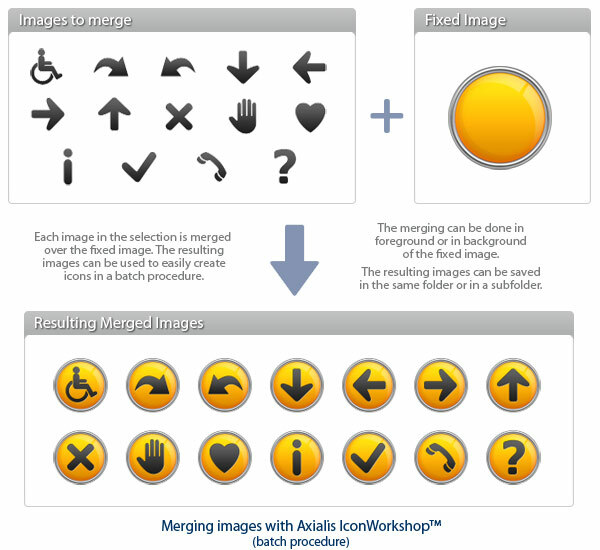 Select the icons files you wish to merge. You can use Shift/Ctrl + Mouse to select several files. Use Ctrl+A to select all. Use +/- to select/unselect by specifying filters. 4. 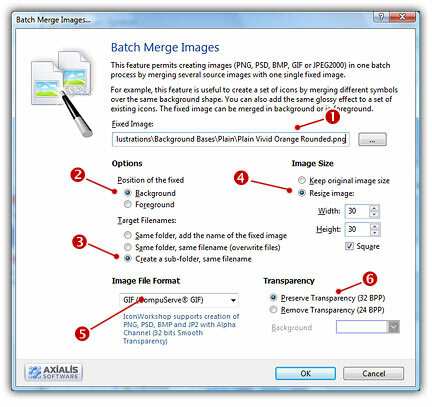 Choose File Browser/Batch Merge Images. 5. A dialog box opens. In "Fixed Image" enter the full pathname of the fixed image file ( ). You can also browse folder to select the file. Background - The fixed image is placed in background and each image is merged "on top". For example, this is used to add a symbol or an overlay image over an opaque object (like in the illustration above). Foreground - The fixed image is merged over each image. For example, this is used to add an effect like a glossy reflexion or a shadow on a set of icons. Same Folder, Add the Name of the Fixed Image - New files will be created in the same folder. The resulting filenames will be: "Name_of_each_image + Name_of_fixed_image + Extension". The Extension change depending of the file type you chose ( ). Same Folder, Same Filename - New files will be created in the same folder. The resulting filenames will be the same as the original images. Original files are overwritten. Create a Subfolder, Same Filename - New files will be created in a subfolder which has the name of the fixed image. The resulting filenames will be the same as the original images. 8. If you want to resize the images during the procedure, select Resize Image ( ) and specify the desired image below. 9. Select file format of the resulting files ( ) and specify the transparency option ( ). 10. Click OK, the batch procedure starts and all the files are created. Using the object packs that we release on regular basis, you can create a large number of icons. Some packs, like the "Pack #5 - Web Illustration", permit creating a list of icons by merging different symbols over the same background base. This is called a "batch merging" procedure. This is useful when you must create several button icons of the same style for a web site. 1. In the Librarian, open the folder "Objects\Pack 5 - Web Illustrations\Background Bases\Plain". Right-click on the file "Plain Vivid Orange Rounded.png" and choose Copy Pathname. This will copy the full pathname of the file in the clipboard. This is the base we'll use to create our list of symbols. We'll need this full pathname in a moment. 2. Open the folder "Objects\Pack 5 - Web Illustrations\Symbols" ( ). Right-click in the file list ( ) and choose Open Folder in File Browser. A new File Browser window opens, displaying the contents of the folder ( ). In Fixed Image, right-click and choose Paste. The full pathname of the file we copied in step 1 is pasted ( ). In Options, select Background ( ) and Create a Sub-folder, same filename ( ). This will place the base in background and create the new files in a subfolder. In Image Size, select Resize Image ( ) and specify 30x30. In Image File Format, select GIF (compuserve) ( ). The last option is Transparency ( ): select Preserve transparency. 4. Click OK. A GIF optimization dialog box opens. Specify the desired options as we've seen in the previous tutorial, Click OK. The batch procedure starts. The full version of the Object Pack #5 - Web Illustration contains more than 205 objects in 2 sizes, 5 colors and hundreds of background bases. The possibilities are almost infinite!